Hanoi (VNA) - Shares continued rising in early August but observers are predicting a slowdown in the short term as shares have become expensive and exposed to profit-taking risk. 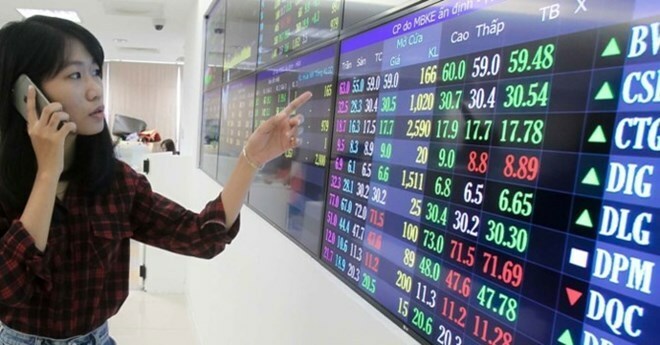 The benchmark VN-Index on the HCM Stock Exchange rose by 1.5 percent in the first week of August and has expanded 18.6 percent since the beginning of this year. On the Hanoi Stock Exchange, the HNX-Index edged up 1.4 percent last week and 27.2 percent over the end of last year. The Vietnamese stock market has been one of the best performers in the world. “I think this increase has reflected investor expectation in 2017. The general market development is fairly reasonable but many stocks have grown expensive and less attractive for investors seeking short-term profits,” said Vo Van Cuong, director of analysis at Maritime Securities Co.
Price to earnings (P/E) ratio of the Vietnamese securities market has increased to 16.6 times, the highest since 2008 and no longer cheap in comparision with other regional markets, and the risk of a correction is rising, Cuong told tinnhanhchungkhoan.vn. “Many stocks are being overvalued while their growth potential is limited,” he said. The VN-Index failed to overcome the short-term resistance of 790 points in the last two weekend sessions but still maintained a nine-year peak of over 788 points that indicated investor caution and hesitation about the market uptrend. Selling pressure increased in large-cap stocks in the weekend trades, especially bank stocks which were negatively affected by the arrest of two former Sacombank officials last week. Sacombank shares decreased for three consecutive sessions but recovered on August 4. Other big banks like Vietcombank, BIDV, Vietinbank, Military Bank and Eximbank experienced profit-taking selling after a long rally. Some industry-leading stocks, such as PV Gas, Bao Viet Holdings and Hoa Phat Group, are also weakening. Money is being channeled into speculative and cheap stocks, such as HAI Agrochem, property developer An Duong Thao Dien, paper manufacturer Hapaco, Vietnam Ocean Shipping, An Phat Securities, Binh Thuan Mineral Industry and Fecon Mining. Last week, liquidity increased with an average of 294.5 million shares worth nearly 4.9 trillion VND (214.4 million USD) being traded on the two exchanges per session, up around 14 percent in both volume and value compared to the previous week. Foreign investors maintained net buying positions in the local market with a total value of 730 billion VND on the two exchanges. According to Nguyen Ngoc Lan, head of brokerage at Agribank Securities Co (Agriseco), the market growth may slow in August with the positive impacts of business results diminished and share prices at new highs. She added business prospects of many businesses are slower than potential of their share price increase.